The first flight by a commercial airline to be powered partly by biofuel has taken place. 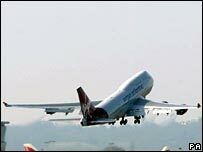 A Virgin Atlantic jumbo jet has flown between London's Heathrow and Amsterdam using fuel derived from a mixture of Brazilian babassu nuts and coconuts. Environmentalists have branded the flight a publicity stunt and claim biofuel cultivation is not sustainable. Earlier this month, Airbus tested another alternative fuel - a synthetic mix of gas-to-liquid. 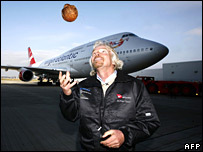 Virgin boss Sir Richard Branson said the flight marked a "vital breakthrough" for the entire airline industry. "This pioneering flight will enable those of us who are serious about reducing our carbon emissions to go on developing the fuels of the future," he said. But he said fully commercial biofuel flights were likely to use feedstocks such as algae rather than the mix used on the passenger-less flight. Virgin's Boeing 747 had one of its four engines connected to an independent biofuel tank that it said could provide 20% of the engine's power. The three other engines were capable of powering the plane on conventional fuel had there been a problem. The company said the babassu tree, native to Brazil, and the coconuts did not compete with staple food sources and came from existing mature plantations. Both products are commonly used in cosmetics and household paper products. One problem with flying planes using biofuel is that it is more likely to freeze at high altitude. The technology is still being developed by companies GE and Boeing, but Virgin believes airlines could routinely be flying on plant power within 10 years. Kenneth Richter, of Friends of the Earth, said the flight was a "gimmick", distracting from real solutions to climate change. "If you look at the latest scientific research it clearly shows biofuels do very little to reduce emissions," he said. "At the same time we are very concerned about the impact of the large-scale increase in biofuel production on the environment and food prices worldwide. "What we need to do is stop this mad expansion of aviation. At the moment it is the fastest growing source of greenhouse gases in the UK, and we need to stop subsidising the industry." Greenpeace's chief scientist, Dr Doug Parr, labelled the flight a "high-altitude greenwash" and said less air travel was the only answer. "Instead of looking for a magic green bullet, Virgin should focus on the real solution to this problem and call for a halt to relentless airport expansion." Airbus ran its test using the world's largest passenger jet, the A380. The three-hour flight from Filton near Bristol to Toulouse on 1 February was part of an ongoing research programme.